The Web provides access to a vast amount of scholarly information such as publications (e.g, journal articles), research data (e.g., datasets, algorithms, services), projects (e.g., H2020-funded) and scholars (e.g., PhD students, researchers, funders, organizations, publishers, policy makers, etc.). This haystack of information bears great potential to foster research collaboration and to encourage interested stakeholders to forge new connections in the scholarly world. Research teams are becoming ever more interdisciplinary as researchers increasingly work in international and cross-disciplinary consortia to enable a multitude of perspectives on specific research questions. The European Commission has recognized the need for national and international collaborative research, reflected in the EC Research Commissioner Carlos Moedas’ strategy, i.e., “open science, open innovation, open to the world”. However, much of this scholarly information is hidden behind publisher walls, or is only accessible via specific repositories (e.g. GitHub, figshare, zenodo) and Websites of scholars, institutions or funding agencies. Searching for scholarly information can be thus tedious and laborious because it requires interested stakeholders to search for information at various places and in various formats. As described in the collaborative knowledge environment OpenUp Hub, easier access to scientific results is needed, also to increase public engagement in research and innovation. We propose to tackle the challenge of facilitating access to scientific results through interlinking of scholarly information. Better access and increased findability of information help get a better picture of the research landscape and its stakeholders. We believe that such transparency will lead to more opportunity in the long run to foster new forms of scholarship and to encourage interested stakeholders to forge new connections in the scholarly world. In this work, we propose to use recommender systems to foster interlinking scholarly information. Specifically, our aim is to link potential scientific project partners based on institutional and personal attributes. Our hope is that this helps enable a culture of open, scientific collaborations. In light of a scholarly commons, we see several use cases to apply recommender systems to support linterlinking of scholarly information, i.e. recommending scientific collaborators, recommending experts / reviewers for articles, recommending tags for resources or recommending related resources. As already discussed in the work of Knoth et al., 2017, recommender systems for scholarly information are a huge challenge since current approaches in the scholarly domain focus either on specific systems (e.g., Mendeley, see Hristakeva et al., 2017) or specific use cases (e.g., only recommend scholarly articles to researchers). 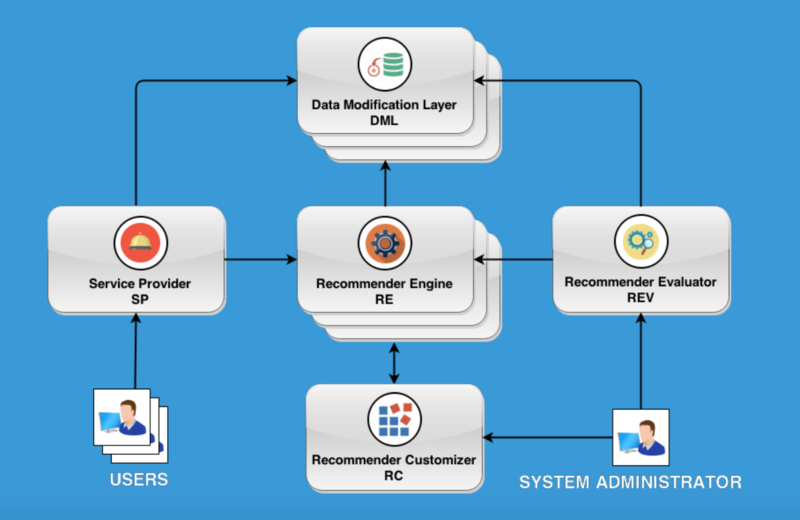 We, however, aim to design a recommender system that can support multiple systems and various use cases. This requires such a system to be able to operate with scholarly information from multiple publishers and researchers, which are typically available in different formats. Also, the system needs to support various types of (potential big) data (e.g. bibliometric data, usage data, information about scholars) and a variety of recommendation algorithms to best process this data and to provide helpful recommendations. Together with our partner OpenAIRE, we have already started working on this. The goal of this recently announced cooperation is to support researchers and institutions to find potential research collaborators, built upon OpenAIRE’s project and other scholarly information. Our efforts will result in a prototype service termed OpenAIRE Matchmaker that will be integrated in the OpenAIRE portal. The basic idea is to dynamically ingesting data regarding funders, projects and project partners from the OpenAIRE API and to apply customised algorithms to create tailored, personalized recommendations for individual users based on their preferences and history. Such recommendation services can also help identify individual experts when searching for conference speakers, reviewers, etc. Most of the proposed systems to recommend scientific collaborators are based on investigating co-authorship networks (e.g. Cohen & Ebel, 2013; Yang et al., 2015; Kong et al., 2017). We however will go beyond pure co-authorship relations, making use of the rich data sources provided by the OpenAIRE API. In terms of algorithms, we will build upon our works on cognitive-inspired recommendation algorithms (e.g. Kowald & Lex, 2015; Kopeinik et al., 2017), which have been shown as effective means to get personalized recommendations in the field of technology-enhanced learning in collaborative and individual settings. Our assumption is that findings from our research on recommending artefacts for technology-enhanced learning can be transferred to the domain of recommending scientific collaborators. The technological basis for this is our scalable recommender framework ScaR. As shown in the Figure, ScaR is based on microservices and thus, not only ensures scalability and flexibility but also adaptability to above mentioned use cases. This means that we can easily extend our underlying data scheme with additional scholarly information in order to enrich the provided recommendations. ScaR has been used in numerous projects, such as e.g. to recommend learning resources, experts and metadata for learning content in the FP7 Learning Layers project, as adaptive recommender service in the H2020 AFEL project and to provide matchmaking functionality for a data market in the Data Markets Austria project (Austrian FFG flagship), where the aim is to match data to use cases and suitable analytics services and algorithms. ScaR is in production use at companies such as Moshbit GmbH, for whom we have implemented a recommender service to recommend jobs to students in their Studo app. Summing up, we believe that our approach to provide recommendations beyond single systems and particular use cases will help facilitate forge new connections in the scholarly world and thus increase research collaborations in the long run.